Made of virgin, high-impact polypropylene throughout to assure durability and reliability. 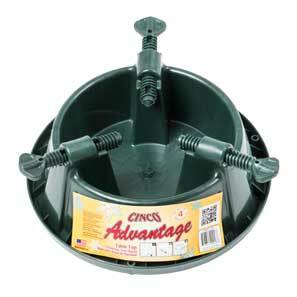 Like all Cinco stands, the Advantage line has a low, wide and generous water holding reservoir to keep the tree fresh. Advantage accommodates low branches. Steel spikes at the center of the reservoir anchor the tree safely, prevent shift and makes set-up a snap. Bolts have an extra coarse thread for ease of use. Spill guard prevents over-filling mishaps.